This sermon was originally preached at St Matthews in Guildford on Pentecost Sunday 2013. It is used here today because our Pastor is on leave for a few days. I don’t suppose you have had many sermons on the Holy Spirit since Pentecost Sunday last year. When we start talking about the Spirit, it’s not long before our words get terribly vague. It’s hard. But then most of the really important, undeniably real things in life are hard to talk about. 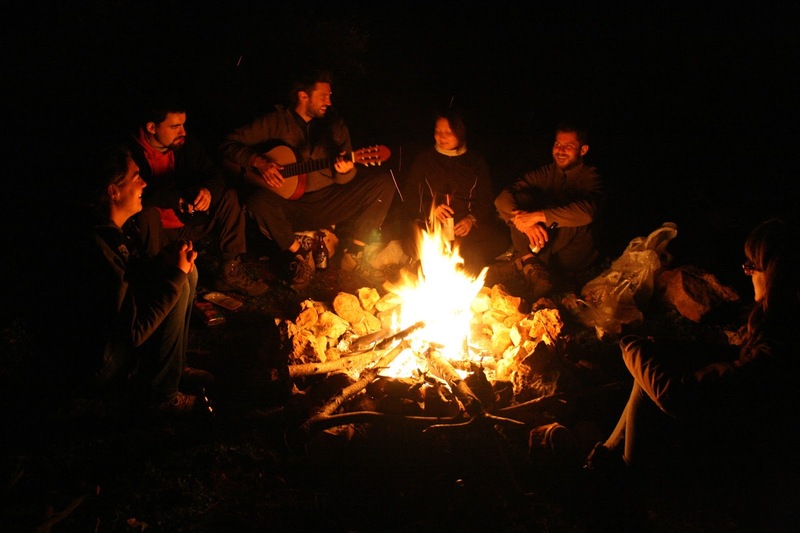 We can sit around a campfire at the end of a great day in the outdoors, or we can light the heater/fire at home on a cold evening. It is good to be warmed by the fire. I love the way the embers glow in a pulsating kind of way that seeps into your eyes and relaxes you. But wait, I am talking about warmth and glowing embers, not fire. Today, my wife and I will be in Albany and we will stand in awe at the Wind Farm as those huge vanes zoomed around making a whooshing sound like nothing I have heard before –the vane tip was travelling at 260kmh. We will see the wind send spray cascading back from the waves on Middleton Beach or maybe even at the new Lookout at The Gap. And love watching the bands of rain-bearing clouds travelled across the sky effortlessly and frequently. But wait, I am talking about wind turbines turning, waves spraying and clouds travelling, not wind. Well, it – wait, there’s the first problem. “It” – the Holy Spirit is not an “it”. The Holy Spirit is a person, but in English, Spirit has no gender so we run into a linguistic problem straight off. In Greek and Hebrew Spirit is feminine and early Byzantine representations of the Holy Spirit did so using feminine figures. So let’s just recall what happened on this day we call “the Birthday of the Church”. The Disciples were all gathered together there in a house waiting for the Spirit to come, as Jesus had promised. Sure enough, she/he – the Holy Spirit – came upon them that day, like wind, like fire. I think I can see sunlightComin’ through a crack in the wall …And I’m gunna sing this song‘til the walls start a-tumblin’ down. The walls that separate who could preach and who could not. All flesh was blessed by the Holy Spirit to proclaim the gospel – not just the male and the educated, but male and female, old and young, slave and free – they all became ministers of the Gospel of Jesus Christ that day. They all came tumblin’ down that day. The Gospel was proclaimed for the first time across barriers of nationality and language. And the people understood and were saved. But I wonder if you noticed – one more set of walls went down when the Spirit came upon them that day. The story starts out with the Disciples safely in a house. Somehow, and the details is not there in the story, the Spirit brought down even the physical walls of that house that were separating the Disciples from the world around them. Suddenly they are outside proclaiming the Gospel to thousands of people, and later on that day they are gathered by a great body of water baptising people left and right. That’s the Holy Spirit. We only know some things by their effects. Breaking down walls is an unmistakeable sign of the Spirit at work: just as the sounds of leaves rustling lets you know the wind is there, or the smell of smoke lets you know there’s fire, so an ever-expanding circle of believers lets you know the Spirit is here. Is the Spirit here in this church, Holy Cross, Hamersley, today? Can we see any of the effects of the Spirit here? What would these walls say, if they could talk? Do we have eyes that can see the working of the Spirit among us? A welcome is also offered to those who bring their children for Baptism because this can be a wonderful time for people to hear the Gospel – the Good News that we are all loved and accepted by God. I see people in this congregation from diverse traditions of faith before they came here, people with disabilities that might in other places become barriers, people across several generations. I think that over the years some of the walls have come tumbling down. There are signs here of people crashing through the barriers that society or tradition have built up so that others can hear the Gospel stories that can transform their lives – and in doing that their own lives have been transformed. There is no doubt in my mind, no hesitation in saying the Holy Spirit is upon us! We who are gathered together in this place have been touched by the flames of fire and swept up in the winds of change. Old and young, male and female, whatever, we have all heard the Gospel and we are all empowered by the Spirit to go and share it. But look out! We think it is just us gathered here in this place. But look again – we find ourselves surrounded by thousands of neighbours – people in our neighbourhood – who want to hear about Jesus. They have heard the Spirit speaking their language. Will the Spirit move us beyond these walls to gossip the Gospel, to share stories about the great love we have known to the people we meet in the park or the Square or the Shopping Centre – not strangers, people we know, our neighbours. Sure as the sound of rustling leaves lets you know the wind is there, sure as the smell of smoke lets you know there’s fire, an ever-expanding circle of believers lets us know the Spirit is here. And the Spirit is about to take us out there! These walls are a tumblin’ down. God most wonderful, Friend most holy, our Easter season is climaxed by this reminder of you sending us your Holy Spirit in abundant power. You have cast down the walls that divide people and prevent them from hearing the Gospel, creating the opportunity for every race and nation on earth to hear the Good news. Embolden us with your Spirit to take that Good News beyond these walls so that every tongue may tell and every life display the wonders of your love. Through Christ Jesus, who lives and loves with you in the unity of the Holy Spirit, one God to be praised forever!